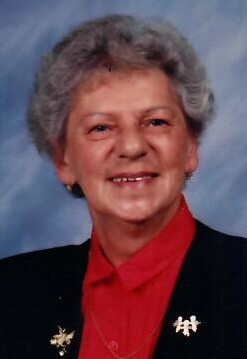 Veronica (Dzialdowski) Tuozzo of Torrington, CT, passed away peacefully on Saturday, November 24, 2018, at her home. She was predeceased by her beloved husband Richard K Tuozzo. She was born on November 2, 1930, in Nanticoke, PA, the daughter of Leo and Amelia Dzialdowski. Veronica (Ronnie) was a Nurse’s Assistant at Charlotte Hungerford Hospital and upon retirement continued to volunteer for the hospital. She enjoyed spending time with her family, especially her grandchildren. Ronnie loved playing bingo, bird watching (with cardinals being a favorite), and loved to collect Angels. She will be remembered as one of the nicest, most loving ladies you ever met - she had a heart of gold. Veronica is survived by daughters, Marie Armstrong of Winsted, Sue Tuozzo (Kathy Tracy) of West Haven, CT, her sons Richard C Tuozzo (Jan) of Torrington, CT and John Tuozzo (Karen) of Holly Springs, NC. She is also survived by her grandchildren (Eric, Nicole, Zac, Carissa, Shannon, Alex & Kyle) along with two great grandchildren (Summer & Marshall) and several nieces and nephews. The funeral procession will leave at 9:30 a.m. on Friday, November 30, 2018, from Cook Funeral Home, 82 Litchfield St., Torrington, to St. Peter Church, (St. John Paul the Great Parish) 107 East Main St., Torrington for a Mass of Christian Burial at 10:00 a.m. Burial will follow at St. Peter Cemetery. Relatives and friends may call on Thursday evening November 29th from 6:00 p.m. to 8:00 p.m. at Cook Funeral Home. In lieu of flowers, memorial contributions may be made to the American Heart Association, P.O. Box 417005, Boston, MA. 02241. Condolences may be sent to the Tuozzo family by visiting www.cookfuneralhomect.com.